Bikaji Sweets - Asli Bikaneri. 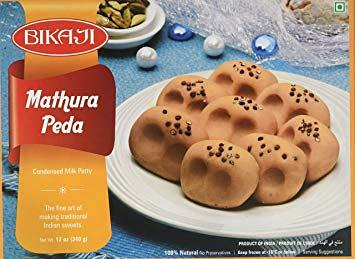 Delicious Mathura Peda from Bikaji. Net Weight - Approx 340 grams. Delivery only in USA. Buy Bikaji Mawa Peda 340 grams, sold & shipped by Yaadein where you can shop online for Pooja Samagri, Hindu Statues, Puja Items, Religious Gifts & Home Decor. This Haldiram & Bikaji collection has been tagged as bikaji usa, gift pack, tasty dessert, bikaneri mithai, indian sweets.